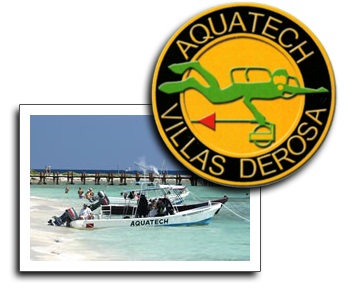 At Villas DeRosa we are proud to have our own private scuba dive center we call Aquatech. In less than a 5 minutes boat ride, we reach the first of many Dive Sites available for our guest to enjoy…. At "Escuela" (Spanish for school), we have a great training site at 30 feet deep. Here there is a pure white sand bottom with islands of reef outcroppings that support many sea life animals to enjoy. For the experienced divers, we have sites like "Canyon Lands". This site starts with a sand bottom at 40 feet. Here the reef begins to form fingers that extend to a depth of 120 feet. The top of the fingers are at 70 feet creating 50 foot walls on either side of the fingers. There are many fingers to explore with wonderful sea life to experience on each one. If you are a certified open water diver you should not miss the opportunity to experience the fresh water Cavern Diving. The Caverns and Caves in the Akumal area are world renowned and an exciting scuba diving experience. In 1984, owners Nancy, Tony and Wayne were some of the first divers to explore these incredible cave systems. When the Aquatech Dive Center was created in 1986, it quickly became the headquarters for the best cavern and cave diving in the world. A cavern dive with Aquatech will be an experience to remember. If you are diving on Cozumel island and want to spend a day diving the amazing caverns on the main land, Aquatech is proud to offers it's famous "Double Underground" package. If the caverns excite you, wait until you see the caves. The cave systems in the Akumal area are some of the most beautiful and mystical underwater caves systems in the world. At Aquatech cavern and cave diving is our specialty and has been for over 30 years. For the certified cave divers, Aquatech is most famous for its all inclusive Cave Package. Discover Scuba, PADI Open Water, Cenote/Cavern, & Cave.